A YOUNG potter from Somers Town in London ended a remarkable three weeks by collecting the winner’s trophy on his Cuestars debut. John Donovan beat Jack Mullen 2-0 in the final of the fourth leg of the Under-21 Bronze Tour at Frames Sports Bar, Coulsdon. The 12-year-old revealed he only entered the event because his World Snooker coach John Woods persuaded him to. 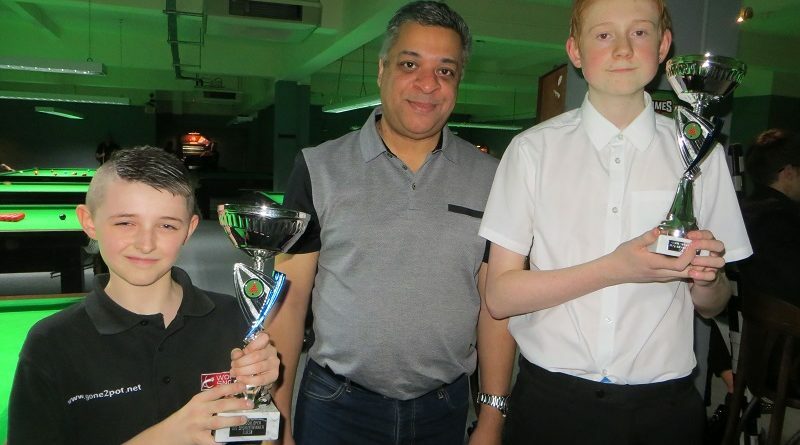 Last month, Donovan, who is based at the Kings Cross Hurricane Room, qualified for the last-16 of the English Under-14 Championship at his first attempt. “I was surprised because I didn’t think I could do it,” he said. He now faces a trip to Leeds next May for the knockout stage. And the following week, he increased his highest break to 33. Beaten finalist Mullen, 15, from South Croydon, was also making his first Cuestars outing. Meanwhile, ten-year-old Owen Jenkins (Havant) remains top of the rankings but his lead over Dylan Smith (Tunbridge Wells) has been cut to five points. Smith beat Jenkins 2-0 in the last-eight but was defeated 2-1 to Mullen in the semi-finals. Third-placed Thomas Sharp (Portsmouth) lost in the semis for the fourth time this season. He went down 2-0 to Donovan, who topped his round-robin group despite losing to Taylor Elliott (Swindon). John Donovan: 24, 24, 23, 21, 21. ROUND-ROBIN GROUP A: 1st, Owen Jenkins (Waterlooville Sports Bar); 2nd, Thomas Sharp (Waterlooville Sports Bar); tied for 3rd, Sam Walter (Mayfair, Gosport), Will Kempson (Salisbury SC), Eddie Mason (Salisbury SC). ROUND-ROBIN GROUP B: 1st, John Donovan (Hurricane Rooms, Kings Cross); 2nd, Daniel Walter (Mayfair, Gosport); 3rd, Dylan Smith (Victoria SC, Tunbridge Wells); 4th, Taylor Elliott (147 SC, Swindon); 5th, Jaydon Elliott (147 SC, Swindon). ROUND-ROBIN GROUP C: 1st, Harry Wyatt (Chandlers Ford SC); 2nd, Jack Mullen (Frames, Coulsdon); 3rd, Katie Griffin (Jesters, Swindon); 4th, George Laxton (Waterlooville Sports Bar); 5th, Freddie Turner (Salisbury SC). QUARTER-FINALS (12 points): Sharp 2-0 Wyatt, Donovan 2-0 Griffin, Smith 2-0 Jenkins, Mullen 2-0 D Walter. SEMI-FINALS (15 points): Mullen 2-1 Smith, Donovan 2-0 Sharp. FINAL (25/18 points): Donovan 2-0 Mullen. From left: John Donovan, Frames owner Tony Thompson, Jack Mullen.